"I believe in Amazing Facts 100 percent!" Meet Lillian, a friend and supporter of the ministry. She enthusiastically shares, "Everything I own belongs to the Lord, and I want to be a good steward." 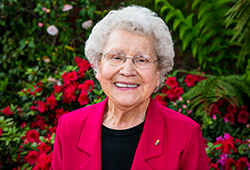 This positive, energetic 87-year-old not only volunteers once a week for Amazing Facts helping in our Bible school, but she also has set up two charitable gift annuities to help spread the gospel. Lillian and her late husband first became acquainted with the ministry more than 20 years ago when they came to Pastor Doug's church in Sacramento. "I really like how clearly he explains God's Word," she shares, "and I believe in his mission of sharing the everlasting gospel. Jesus is coming soon, and I?m happy to do what I can to help!" One way she supports the ministry is by sharing with others the Amazing Facts Bible Study Guides. "I enjoy meeting people and talking with them about the Lord. Often we get on the topic of the Bible, and people have questions. So I give them a Study Guide." Lillian lives out what she believes. Her witness led her sister-in-law, who was at first reluctant about Lillian's faith, to eventually study the Word and be baptized! Another significant way Lillian shows her love for Amazing Facts is through charitable gift annuities. When tragedy struck in 1979 and her 29-year-old son was killed in a car accident, she inherited his rental properties. About 10 years ago, she decided she no longer needed one of those houses and used it to fund a charitable gift annuity benefiting the work of Christ through Amazing Facts. "I really like the gift annuity plan," she explains, "because for the rest of my life, I receive a monthly check from Amazing Facts." A gift annuity is simply an arrangement between Lillian and Amazing Facts in which she transferred her asset to the ministry in exchange for a lifetime income stream, plus a charitable deduction for her gift. Last year, she sold a second rental house from her inheritance and set up a second gift annuity. "I love the last-day work of Amazing Facts and really want to support it," she says, "and now each month I receive two checks from Amazing Facts for these two gift annuities. God has blessed us both!" If you would like to experience a double blessing like Lillian, contact our planned giving department by calling 800-436-2695 or visit us on the web at enduringlegacy.org to learn more about giving options that will help Amazing Facts spread the everlasting gospel in these last days.